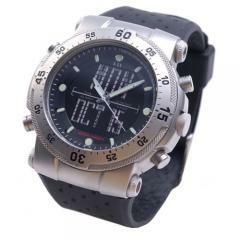 511 Tactical 592099991 SZ Titanium HRT Tactical Watch (59209) FREE SHIPPING! have many watches and jewelry to choose from. Ballistic precision on the go with the HRT Tactical Watch. Produced in partnership with Horus Vision, LLC. Calculate your bullet's point of impact by inputting data that affects a bullets flight. Calculate for temperature, bore height, ballistic coefficient, muzzle velocity, and zero range. Results can be displayed in MILS, TMOA or SMOA. Over-size digital display: Day, date, month. Second time zone. Alarm. Chronograph, (1/100th, lap time). Countdown timer. ©2002-2019 CopsPlus.com: 511 Tactical 592099991 SZ Titanium HRT Tactical Watch (59209) FREE SHIPPING!